Rapid expansion: Growth is good, but when it happens to your company too quickly, your brand can suffer. 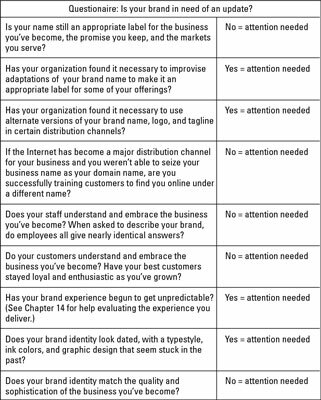 If your organization has experienced dramatic growth in the most recent six-month period, evaluate whether your brand identity still reflects the character, values, and attributes of your evolving business situation. Major product, channel, or strategic diversification: The marketplace is in constant flux. Amidst this change, companies are refocusing or changing strategic direction — and brand identities — to adapt to changing business environments. A merger or acquisition: Whether companies are acquired or merge, their brands rarely blend into one. Essentially, a brand is an organization’s promise, so in merging two promises, merged companies rarely end up with a stronger promise. In most corporate acquisitions or mergers, the two organizations assess the value of each brand and the equity of each brand’s identifying elements. A dated brand identity: In the low-budget start-up days, many businesses resort to brand identities that are either self-designed or whipped up by an aspiring artist recommended by the friend of a friend of a cousin of a brother-in-law. Also, some typestyles, colors, and graphic approaches are stuck in eras thankfully long past. (Think of the colors and style of the 1960s!) When that’s the case, brand revitalization is in order.